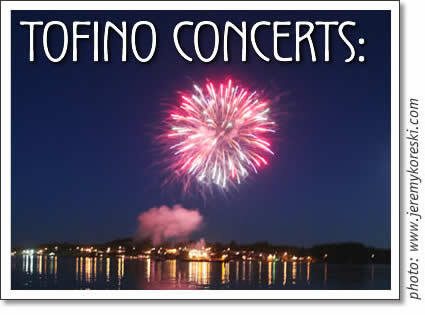 The following concerts are happening in Tofino in the month of February. Tickets are available at Tofitian, Esso and at the Common Loaf. This is a special opportunity to catch Shaun on his own without the rest of the band. As the guitarist and primary vocalist of Wide Mouth Mason, Shaun's skills as a songwriter and lyricist has contributed to the band's ability to speak to the emotions of life that are not only felt and experienced by themselves as individuals but are also expressed musically in ways that allow fans to hear a part of themselves in their music. Shauns affinity for music began with picking up a Seagull Acoustic guitar that would become one of the guiding passions of Shaun's life. With just his acoustic guitar and his voice Wil belts out a sound that could come from a four piece band. He creates a powerful musical punch on stage that leaves his audiences reeling. His sound is "electro-acoustic", he plugs into a smorgasbord of foot pedals. A clear acoustic guitar, overtop of distortion, with heavy bass tones filling out the bottom. Wils live shows are truly amazing. Nine Mile easily dissolves the lines that separate traditional genres by melding rock, funk, Caribbean, and folk influences into a high-energy grooveoriented performance best described as urban acoustic pop. Critics have made comparisons to such legends as Paul Simon (for their dedication to melody and musicianship), and Ben Harper (for their ability to transition rock, country, folk and reggae smoothly). However, it is the captivating musicality of Nine Mile's live performances, and the strength of the songs themselves, that is turning heads. Any precise characterisation of an artist who has to be seen live is impossible to pinpoint. Bocephus King has been keeping the critics guessing for years and has inspired labels from pop-folk to roots rock to carnival burlesque. None of these seem to stick, however, as Bocephus King shakes off each new description with every performance. Keeping haphazardly to the middle ground somewhere between solid blues-based rock and a three ring circus, Bocephus King are the epitome of the saying "you have to see them live"